Note: Due to the nature of our vinyl prints they can get and look wrinkled. To address this iron the print from inside out on the lowest setting. It's important to us that you are happy, satisfied, perform well and look good in any of our DED products. Below is is a comprehensive guide on how to get the right fitting DED shirt. DED shirts are designed to be comparable to US sizing. Typically, you can get a US made shirt and use the size indicated as a basis of your order. For example, if you are are a LARGE in the US, then you should order a LARGE DED shirt. However, we recommend getting your measurements before ordering to ensure proper fitting. Get a tape measure and place the tape measure under your arms at the fullest part of your chest, wrap around your body until your fingers meet and note the measurement. Check the size chart and match your measurement to the corresponding size. 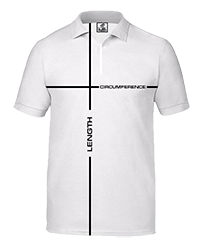 Alternatively, you may also get your best fitting shirt and measure the width of said shirt. Multiply the width by two (2) and note the result. Check the size chart and match your measurement to the corresponding size. If there is a part of your torso that is fuller than your chest such as your waist, please use that measurement and match it to the corresponding size. XTech Short Sleeve Jersey "Energy"
XTech Short Sleeve Jersey "Spyder"